Whether it’s Harley Davidson, Bill Wall Leather or Studio City Tattoo, these companies are known for providing the best quality and service in their respected industries. You take pride in your ride and the jewelry you wear. We take the same pride in our workmanship and service in providing you a tattoo or body piercing. When you live a lifestyle involving your passions only the best will do! Ride to Studio City Tattoo in Studio City the heart of Hollywood and check out our shop. We have been in business for 25 years and have the best clientele anywhere. Recently we have joined the Bill Wall Leather family and have become an authorized BWL jewelry dealer. Studio City Tattoo, we’re your one-stop shop for the finest biker jewelry and quality tattooing. We only carry the highest quality jewelry and provide the best tattooing. Because we ride, wear and tattoo only the best, we know and understand what you’re looking for when you get your Harley Davidson tattoo. 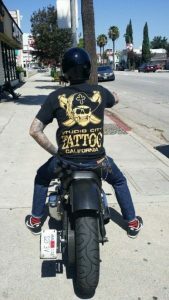 So when you are out on a ride and in the Los Angeles are stop by and check out our large selection of beautiful jewelry, and our portfolio or fine electric tattooing. Oh and lets not forget that wild new body piercing!